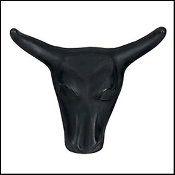 All Products >> Junior Steer Head - 12"
Junior Steer Head - 12"
Black Junior Steer Head, 12" horn span. Made of durable polypro plastic and includes two 14" steel rods for use in a bale of hay. Available in black or pink.